With the Master replacing all of humanity for most of the running time, we didn't need to deal with random characters like the Naismiths. John Simm's performance as the Master was toned-down just enough so that he still seemed crazy while not overwhelming every other character on screen. (That's an impressive feat, given that in certain portions of the movie, he was every character on screen.) And he was in turn well-matched by Timothy Dalton(*), who was able to convey the insanity, arrogance and sheer danger of the Time Lords circa the end of the Time War - and to explain why The Doctor would have been willing to exterminate his own race right along with the Daleks. (**) Steven Moffat has said he's not interested in spending a lot of time on classic "Who" villains, so it's entirely possible this will be the last we see of the Master in any incarnation. But Davies left things vague enough that Moffat could use the guy again, should he desire. Well done. As Nine would say, you were fantastic. • Davies wasn't big on throwing in references to non-"Who" pop culture during his run, but this one had a few really obvious nods to some big guns of sci-fi, with Wilf's stint as an asteroid laser gunner obviously modeled on Luke Skywalker and Han Solo in the Millennium Falcon's turret guns in the original "Star Wars," Captain Jack's space cantina (featuring lots of Davies-era aliens like the Adipose and the Judoon) modeled on a similar sequence also in "Star Wars," and The Doctor's fate in the radiation chamber looked quite a bit like Mr. Spock's sacrifice in "Star Trek II: The Wrath of Khan." For that matter, the scene where The Doctor shut off all the systems on the salvage ship so the Master couldn't find it felt very much like a silent running sequence from any number of classic submarine movies. No matter what a sci-fi program throws my way in the form of techno-babble, I'm pretty much willing to accept it. But all it takes is one instance of illogical behavior and I could lose that whole willing suspension of disbelief. RTD came pretty close to snapping that with the Doctor's re-entry into the mansion. The Fourth Doctor fell from a radio tower and he ended up regenerating. But Ten falls from the sky, through a glass skylight, and smashes on the floor and he doesn't go through the change right then? Because of that, I started questioning a lot of things: the Doctor turns his back on Rassilon and his glove (or on the Master and his electrical powers) and doesn't get zapped in the back? That alien device was designed to vent the radiation right back into an occupied glass chamber? Why didn't the Doctor just shake the radiation out of his foot into his sneaker, like he did in "Smith And Jones"? Still, having the prophecy turn out to be caused by Wilfred was brilliant. And I think using Donna but keeping her on the sideline was the right way to go. Too much involvement by Rose after her storyline ended just diluted the impact of her departure. At any rate, just for that final fifteen minutes, the interaction between Tennant and Bernard Cribbins, and the revelation of the prophecy, this was a nice send-off. The second part certainly made up for the first. Tennant and Cribbins were excellent once again and the perverse twist to have the four knocks come from Wilf, just when you think that perhaps Ten may escape death yet again, was killer. It was hard not to cry at that point until the end. Having just watched Tennant's Hamlet the day before, I noticed many parallels in the intensity of both performances certainly similarities with the "lonely god" and "lonely prince". Sure the goodbye sequence was like The Return of The King, but it was RTD's last episode and if these characters are never to be seen again, then it is only fitting to see how they end up. The Sarah Jane visit and Verity Newman ones were probably the most touching ones, with SJ having been through regenerations before. Rose's story has been so diluted since the end of Doomsday, that RTD could only send Ten to before they (and Nine) met, but it worked pretty well. Martha's happy ending was a bit out of nowhere because I thought she was married to Doctor Tom (wasn't there mention that she was on her honeymoon? maybe it was on Torchwood?) but Mickey in the latter years ins't so bad I suppose. It was just Donna that I felt was cheated. Sure RTD couldn't undo Journey's End, but he had already done a bit with the "defense" mechanism and why couldn't her inability to remember only be linked to Ten still being alive and letting her have her memories when he is gone. As it stands, instead of regaining the self-esteem that she had developed in her travels with the Doctor, she gets a guy and a lottery ticket. As for Matt Smith, his few moments at the end and the preview made me feel that this franchise was going to be okay. Steven Moffat certainly created a much needed tone change so that there would be a little bit of optimism to end the episode, since there had probably been a lot of sniffles at that point. I've heard that according to the podcast commentary, it was supposed to be his mother, however the fan theory that I prefer was that it was Susan, the Doctor's granddaughter, who was one of the First Doctor's original companions. This would also explain why Ten looked at Donna when Wilf asked who the woman is. I'm still dissatisfied with Donna's ending. She was, for me, the best companion and the most deserving of a happy ending. She got it to some extent with her wedding and lotto ticket blah blah blah, but those seem like consolation prizes in comparison to memories of adventures across time and space with the Doctor. She had such a beautiful character arc over the course of series 4 that I was crushed when she wasn't allowed to remember any of it in the end; it was a needless tragedy that I was hoping End of Time would fix. End of TIme was Okay. Though I loved the performances of Timothy Dalton and John Simm, the main plot wasn't particularly compelling. I thought the Doctor said a few awful things to Wilf while in the chamber ("You're no one! "), though I guess I could understand that he's rude, not a ginger, and about to face his death. I still felt pretty lukewarm towards the End of Time, but several hours later, I'm really sad about the end of Tennant's run. It is like losing a good friend. For those interested there's a Davies / Gardner podcast commentary for Part II on iTunes for download. Not sure if it's still available but there was also one for the first as well. I was just happy they avoided the direct Wrath of Khan lift of having Tennett regenerate in the plexiglass booth, which is where all plot threads appeared to be heading. And I agree with Nicole about Donna's ending. Donna herself will think it's awesome of course, but it seemed like she was being set up for more and I was disappointed when it didn't happen. I think once Davies came up with that fate for Donna in "Journey's End," he had to stick with it, even though it was an incredibly brutal end for a popular, likable character. Giving Donna her memories back would have been a cheat, so all that was left was consolation prizes (nice husband, lotto ticket). Also, there's the fact that Davies needed to wipe the slate clean for Moffat, and a Donna with an intact memory would demand to climb right back on the TARDIS. As she said several times in the fourth season, she intended to spend the rest of her life traveling aboard that ship. Speak for yourself on the not-wanting-Ten-to-die thing. All through the endless whining and the Return of the King-style endless string of endings I was yelling at my screen for him to just "shut up and die!" This show has been in dire need of fresh blood and good writing for a while now, and I can't wait to see what Moffat and Matt Smith have in store for us. That didn't stop him when Rose was involved. I liked Part 2 a LOT. While it didn't quite have the emotional resonance of the first two Rose-based Davies series finales, it seemed more grounded in, er, "reality." I also like that the second The Master took over the human race, we finally got to see more of John Simm -- whom I loved in "Life on Mars" -- that just crazy-eyed scenery-chewing. Unlike the last couple of series finales, this one seemed to focus more focused on the kind of Doctor that Ten was, and -- of course -- why Tennant was so amazing in the role. Even there it was only a half-measure: Rose still trapped on the Steel earth, and with a guy who's only sort of her Doctor, unable to travel through time and space. I could very easily see the Donna-Doctor become a really surly, unlikable person when forced to deal with real life, aging, jobs and all the rest. Once again RTD just completely ignores all the classic Who history, no he doesn't just ignore it, he spits on it. Having ten fall through the skylight should have killed him there. Rassilon really? Come on Dalton's president was in no way Rassilon. Three also died from radiation, and it wasn't immediate, but he also didn't set anything on fire, hell Sarah Jane held his head in her lap as he regenerated. The Tardis has always been said to help with regeneration, so his destruction of it was asinine. Too many questions left unanswered, too many plot points waved away and meaningless, and of course RTD just had to throw ROSE in another episode. Thank God RTD is gone. I didn't check the credits but was that Russell T Davies in a purple sweater jumping around in the street when Galifrey disappeared from the sky? Was that his reward? His Alfred Hitchcock on-screen moment? I felt part 1 was definitely overstuffed and confusing, but I absolutely loved part 2. We've seen so much of the Doctor's pain over ending his own race that it was some much-needed closure to understand that he may have had some good reasons for letting it happen. I'm still not completely sure why Wilf wasn't affected by the Master's transformations other than that the plot required that he not be. But who cares? Bernard Cribbins rocked that role from here to Christmas. There wasn't a moment he was on screen that wasn't pure gold. The four knocks coming from Wilf was so unexpected and so poignant and, somehow, so perfect. Matt Smith didn't bug me quite as much as I'd expected him to, but his manicness felt a little too much like Tennant's. Although--without revealing anything from the previews--I agree with Alan that he looked pretty good down the road. I can't wait for spring!! I'm still not completely sure why Wilf wasn't affected by the Master's transformations other than that the plot required that he not be. Wilf was safe inside the chamber with the alien glass, and thus immune from the machine's healing pulse. I now believe that RTD is the greatest fanfic writer ever. The episode was over-the-top jammed with good stuff. My only complaint is the long tour the Doctor took after the regeneration started. They could write a whole series covering that time. And it came so soon after the characters reunited at the end of series 4, that it felt more self-indulgent than anything. But, like you Alan, I never saw the old series, and like you, think Tennant has been amazing in the role. Fun, exciting, full of wonder, yet capable of great darkness. I have a hard time imagining any other possible personality for near-immortal, near-omnipotent time traveler. Luckily I have faith in Moffat that I can't wait for the new series. I meant the original transformation, in part 1. He wasn't behind glass then, was he? Now I'm doubting my memory! I wonder if Moffat will be able to resist the temptation, way down the road, to bring Tennant back for a guest appearance, as almost-Ten. I meant the original transformation, in part 1. He wasn't behind glass then, was he? Yes, he was. I forget why, but he's in the chamber when the Master uses the machine. If the part one was heinous, part two was merely bad. From the dozen limp non-conflicts -- (All the Time Lords are coming back, no they aren't! The Doctor has to use a gun -- to shoot a machine! The Master has control of the entire Earth's nuclear arsenal -- and sends ten missiles after the Cactus ship! Donna's brain is going to melt -- oh no it doesn't! The Doctor will see Cribbins one last time, ooo... in like two minutes, nevermind!) -- to the corn (and I'm sorry, the Cribbins character is pure, dopey pandering as far as I'm concerned, just a giant Hallmark card; and speaking of Hallmark cards, nice of the Ood to project themselves through space and time to deliver theirs, ugh) this was just a mess. They brought Timothy Dalton in to (1) sit at a table and (2) stand still holding a Dr. Doom glove, money well spent. Doctor's Mom? I thought they were test tube babies on Gallifrey, or something, whatever. BUT. The Master's backstory (however awkwardly squeezed in) gave Simm his first nice moments of this series, the suicide cult menace of what the Time Lords had become in the Time War was interesting (Tennant's line of tossed-off dialogue had more interesting stuff than anything we actually got to see in the whole 2 1/4 hours), and Davies gave Tennant the perfect last fanboy line. The victory lap at the end would have been much more effective had it not felt like the show had made those same rounds several times before, but Redfern's granddaughter made me tear up and the Rose thing was much better than a contrived re-opening of Earth-2 (which shows some sort of restraint on Davies' part, I guess). As for Doctor #11, it felt very bad to me, like Smith was doing a Tennant impersonation. When Ten popped out of Nine, there was an immediate connection, but this was too much of the same too soon. Maybe I was hoping the Twilight Doctor would be sort of serious. But after the effects of the regeneration wear off they can do any old thing with the kid and I'll hope for the best. I also hope Moffat brings in a new guy to handle the score, because understatement on ANY level would be a welcome change. I'm pretty sure that he's in the chamber when The Master uses the healing ray because the Doctor hustles him in there. I loved it. It's a shame we've no longer got David Tennant, but I'm looking forward to this whole reboot that Steven Moffat is going to give the next series - which they're even referring to as 'Series 1' rather than 'Series 5'. I think that's a good indicator of how radical a difference they want. I really loved Part 2, due entirely to David Tennant's and Bernard Cribbins' performances. One thing I'm wondering about as we move forward-- the character played by Claire Bloom was forced to kneel with her head in her hands "like the weeping angels of old" (or something like that, according to Dalton). Could this be a set-up for the return (and expansion) of the scary angel statues from Blink (a Moffat creation, after all)? The only DW episode to feature a Simpsons shout-out? Absolutely no complaints here. Bravo to Tennant and RTD. I won't soon forget the hours spent in their company. I loved that 11 made a comment about still not being a ginger. It made my day. DT shall be missed, but I'm looking forward to both the new guy and to "Rex is Not Your Lawyer". In the meantime, I have just cracked open my first season of Tom Baker after having sampled chunks of Hartnell and Pertwee. Can't wait. I understand from the original series that the Doctor only has ten regerations so how will they resolve this in future episodes or incarnations of the Doctor? Thumbs up for me, mostly for all the small moments. The gun thing/turning his back on Timothy Dalton wasn't very logical. Why didn't Dalton just smote him? One technical thing that bothered me was it looked to me that Dalton and entourage were filmed separate from the actual mansion set--that he was never actually in the same room as Tennant and Simm. Even in the few POV shots looking at him from within the room, it looks like they are on a screen, not actually there. I thought it might have been a cost-saving thing to film Dalton's scenes when/where they could get him, and not bring him into the larger set. I could be wrong, but I've watched it twice and it jumped out at me each time. i think the woman wilf was talking to was romana. i might not be right, but i like the idea. The Time Lords can regenerate twelve times, thus the "last one" would be 13. Although old Who has mention a Valeyard that comes in between there, so there is plenty for Moffat to work with. And the Master has gone past the limit, so I guess this isn't set in stone. The Confidential showed the set and Dalton was physically in the same room as the Doctor and the Master. It was probably just the camera angles that made it look weird. While having the older woman be Susan, RTD indicated in the commentary to this episode that she was the Doctor's mother (the other woman hiding her face is likely the Master's mother) and when Claire Bloom was cast for this role, the press in the UK were referencing her as the Doctor's mother. I don't know why her role became ambiguous. RTD probably did this for kicks to mee with the fans. Thanks Nicole, I was hoping someone would know. One other thing that bothered me: I watched a lot of the marathon, and River Song's story jumped out at me. She knows the Doctor's name, etc. Then her clips are the final ones in the DT special that preceded the finale. So I was very surprised that she didn't show up at all, or at least a reference to her. @Bernie: Actually, it was 13 regenerations in the original series, but I'm sure they'll find a way around that when the time comes. They got around it for the Master, who had used up his 13 during the original series. The marriage of Mickey and Martha seemed to come out of nowhere, but I'm pleased that Mickey found himself a good woman. Mickey was originally written as a doormat, and even as the character grew, Rose treated him like nothing more than a safety net. I'm glad that he found someone who seems to appreciate him. Like everyone else, I really liked the idea that the Doctor died in a way that we didn't expect: not in battle against the Master or the Time Lords -- he survived all that and thought he had beaten his fate. Instead, after everything else was resolved, after he had cheated death, he sacrificed himself to save Wilf, an old man of no historical significance who had been a good and loyal companion. Overall, I think I would have enjoyed this episode more if it weren't for the spoilers and rumors floating around before the episode that never paid off. It was widely reported as early as last April that Claire Bloom (they mystery woman) was playing the Doctor's mother... but that was never revealed in the episode. Apparently, that was indeed what they had in mind, and I have heard that this was made explicit in one of those "Doctor Who Confidential" things after the broadcast in England, but it wasn't broadcast here. But it was never stated anywhere in the episode itself, and that's frustrating. Also, Part 1 had all sorts of indications that there was something special about Wilf and Donna that caused them to continually run into the Doctor and caused The Woman to repeatedly contact Wilf. There was buzz all over that Wilfred Mott is an anagram of "Time Lord FTW" (or my preference: Time Lord WTF?)... but that never went anywhere. Of course, if the Time Lord woman is the Doctor's mother, then this contradicts the Paul McGann movie, where it was an important plot point that the Doctor's mother was at least part human (a plot point that everybody hates and wishes would go away, but there it is, and RTD repeatedly affirmed that the Paul McGann movie is canon). I had a bizarre thought that would pull this all together: The Woman is indeed the Doctor's mother... and she's also Donna Noble in the future. Perhaps regenerated into a fully Time Lord form after her human death. That would explain how the Doctor is "half human on his mother's side": Donna is "half human, half Time Lord." It would also explain why the Doctor's mother has such an interest in Wilf: Wilf is her grandfather! The Doctor said he would be happy to have Wilf as a father; this theory would make Wilf his great-grandfather. I notice that near the end, when Wilf asks who that woman was, the Doctor looks at Donna. Of course, there is a paradox here: Donna was made a Time Lord by contact with the hand of the Doctor, who would be her son. But paradox never stopped Doctor Who before. Just a wacky fannish thought. So I was very surprised that she didn't show up at all, or at least a reference to her. River Song is a Moffat creation. I'm sure he has plans for her in his run, which is why Davies left her alone. Tracey, I think Wilf is cosmically important - and therefore able to track The Doctor down when no other human could - because he's the man destined to bring about Ten's death. Craig, no discussion of the content of the teaser trailer. As I said in the original post. I had a bizarre thought that would pull this all together: The Woman is indeed the Doctor's mother... and she's also Donna Noble in the future. Tracey: Oh God, please no... You know what I always really loved about Donna -- she's absolutely HUMAN. She's a little nobody from nowhere, but she's still got the guts to get in the face of The Doctor. Just tell him to stop, to think again. And in a funny way, the more I think about it the less I actually care who The Woman is. What is really matters is that at the end, someone on Gallifrey would stand up against Rassillon. She would ensure her own death, the end of her world, a billion years of Time Lord history and ten million years of absolute power, because it was the right thing to do to end a war responsible for the endless suffering of untold billions of "little people". She would not stand by and allow untold horrors to be released on all creation before it was ripped apart, just so she could live. In the face of the Time Lords' ultimate corruption and evil, The Doctor still touched someone on the homeworld he ran away from so long ago. At the end, they weren't totally beyond redemption. Um, fair enough. Sorry, I forgot because that piece of casting was officially announced by the BBC in the UK months ago. 1) The Weeping Angels returning? Perhaps, but I think that reference was nothing more than Rassillon further humiliating the two who DARED to vote against him. In 'Blink', The Doctor mentioned in passing that they're a very old race, even older than The Time Lords, and universally despised and feared wherever they're known. @Tracey: "this contradicts the Paul McGann movie, where it was an important plot point that the Doctor's mother was at least part human"
To be honest, I get a bit pissed off at the idea that Donna was somehow "cheated" or had to "settle" for a "consolation prize". I think The Doctor might beg to differ that Donna got the short end of the stick. His last sight of her was "my best friend" being surrounded by friends and family (wasn't it nice to see Sylvia happy and NOT endlessly bitching and sniping for once? ), and married to a decent man she loves and isn't irradiating her as part of an alien plot to turn the Earth into baby food. Sounds a lot to me like the life The Doctor can never have. Is Sarah Jane settling for second-best with Luke, the son she thought she'd never have? Are Mickey and Martha -- in love and still fighting the good fight in their own way? Did Joan Redfern settle? Or Captain Jack with the prospect of a good old fashioned therapeutic shag with Midshipman Frame? None of them are "little people", and wonderful as travelling with The Doctor in the Tardis is, their choices, their own lives, aren't second rate. Nobody's life is. "And we don't want you to go, Doctor, but this is how this particular game has always been played, alas." Hey Alan, I was wondering what you meant by this comment...Is there more to this story that we don't know? I have been wondering how David Tennant's decision to leave came about and I was wondering if you knew more than we would. I have to say I don't quiet like the 11th Doctor. I don't have high expectations for doctors but I at least want them to have eye brows. I don't think I am asking for much. Totally crushed that Tennant's days are over. He was and will be my favorite. As he said in the finale "It would be an honor". It was an honor to watch such great acting. Just that it's not a part anyone stays in forever. Eventually the actor either decides to leave, or he gets fired, and then that Doctor has to die. Lindsay: With all due and sincere respect, perhaps we could hang fire until we've seen more than thirty seconds of Matt Smith? You know, I don't think that's too much to ask for. FWIW, I think we can take Tennant at his word about why he decided to leave. With RTD, Julie Gardner and Phil Colinson all moving on, he just decided that it was the right time -- as he's said repeatedly, the best time to leave the stage is when people are still sad you're going. The last thing you want to do in a show as high profile and physically demanding as 'Doctor Who' is to get bored and start phoning it in. The beauty of Donna's memory wipe is that we can all pretend, in our ordinary lives, that, just maybe, we too have had such glorious adventures when we transcended our quotidian selves. Tracey, I very much like your theory! I'm just happy that Moffat is finally taking over. I have not been terribly happy with RTD's tenure. Toby, I agree. Most of the time I am perfectly content to suspend disbelief in this and other scifi shows, even considering the mix of old and new style aliens that seems to be the hallmark of this incarnation of the DW series. But for me, for some reason, it was the lack of CGI in one scene that knocked me of of that suspension bridge. When the planet Gallifrey is descending upon Earth at the end of part 2, and everyone is running around and screaming, all there was in the way of atmospheric disturbance was a bit of wind in Donna's mum's hair. The lovely white fluffy clouds didn't even change! I am not a meteorologist, but I am guessing that there would have been SOME sort of reaction. And that is not even considering what kind of changes the gravitational pull of another planet so close might have wrought. I know this really is very picky and unimportant in the grand scheme of the show (which I adored, by the way), but, for some reason, it showed up on my radar. So, yeah. Hmm. I am not a meteorologist, but I am guessing that there would have been SOME sort of reaction. Well, the simple reality is that the FX budget for a whole series of 'Doctor Who' wouldn't pay for a frame of 'Avatar'. And I've never heard anyone connected with the show complain about having too much time or money. There's endless choices to me made about where to apply extremely tight budgets. The special effects are spectacular for nuWho when compared to the older episodes, so I really don't think it's fair to complain about the quality of the effects. I don't know what the exact budget for a BBC show is, but I suspect it's much less than even a US network show. This show is more about the characters anyway, which is why is has lasted for so long. That said, other than the fact that they've picked someone with even floppier hair to be the new Doctor, I am looking forward to the Moffat era, as he's written all my favorite episodes so far. And I'm looking forward to the charming Mr. Tennant's debut on American TV someday... I know he got cast in the pilot "Rex is Not Your Lawyer" but I wonder if it'll get picked up. I was less a fan of the episode. I'm still going to miss Ten, but I found the last 20 minute goodbye sequence to be a bit tedious and over the top (so much that I was actually a tiny bit happy seeing Ten go, so it could end), especially since we just saw the bulk of them (Verity was a nice touch, I didn't expect to see her)in the s4 finale. Agree with Wilf and Ten, best parts of the special (those last knocks were pretty great, after the crisises were over) but I was wondering why the Doctor couldn't use his screwdriver to get Wilf out. If Donna wasn't to matter at all, then I'd preferred not to have her in the special at all (save the last sequence) - off on a holiday or something, so they could focus just on Wilf (and still have the same scenes). It was too great of a tease to see Donna again starting to remember again, to be her magnificent self again, to help out or something (and revert back afterwards if one must stick with the gut wrenching consequence of S4 finale) - then, boom! Nothing. She missed everything again. And the consolation prize of a lotto ticket (essentially, money) just didn't sit well with me. I'm liking the new energy and excitement of a new doctor and a new head writer. I love Nine, but I love Ten too. With Moffat heading the ship, I think I'm going to love Eleven too. @Toby: Yeah, the line was ambiguous, and I tried to ignore it. But there was a plot point that required him to be part human (something the Doctor could do that the Master couldn't do because the Doctor was part human). I don't remember the details well; I haven't seen it since it was broadcast and tried to forget it at the time. @Christy: I like that thought about the memory wipe! Oh, one more thing I forgot to mention: totally chilling that the Time Lords deliberately caused the Master's madness, so they could use him as a bridge to open the time lock. Again, shows you why they're the kind of people that need to be locked up! Oh, and about the name "Verity" for that author character: that's a tip-of-the-hat to Verity Lambert, who was the original producer of Doctor Who back in 1963. She was one of the first female television producers in Britain, and was assigned to this series at a time when it was thought to be a bit of children's fluff that wouldn't last. Her name is well-known in Britain; not so much in America. Re: River Song. A couple of years ago at Comic-Con's Who panel, I asked Moffat if Song had recognized Ten's physical appearance or rather recognized his inherent "Doctorness". His reply was that, as he was writing it, he thought she had previously met Ten and at least one other Doctor. On the other hands, 1) that's what he thought, but it wasn't specifically stated on screen and 2) during the rest of the panel, it was made very clear that given Doctor Who being a time travel show, continuity could be kinda weak anyway. So either way, Ten's meeting Song later in his timeline/earlier in hers isn't canon. Oh, and about the name "Verity" for that author character: that's a tip-of-the-hat to Verity Lambert, who was the original producer of Doctor Who back in 1963. And her surname, Newman was also a tip of the hat to Sydney Newman, who during his tenure as head of drama at the BBC commissioned and was the first executive producer of 'Doctor Who' (and much else besides). He also created 'The Avengers' before joining the BBC. Two icons of British cult genre telvision isn't a bad run for a boy from Toronto. And the consolation prize of a lotto ticket (essentially, money) just didn't sit well with me. Why? I know it's way too mundane, but it's been pretty well sign-posted that Nobles were having a pretty tough time after Donna's Dad died suddenly. In both 'Partners in Crime' and 'Turn Left' Sylvia is fighting with Donna about getting a "proper job", because the mortgage isn't going to pay itself. An anxiety I suspect a few viewers out there in the real world can totally identify with. Sean's a good man, but he's no better off. Donna sure isn't marrying for money. What else can The Doctor do for Donna and her family that isn't going to kill her? He can't give Donna her memories back and take her away in the TARDIS, but he can make sure that Sylvia will always have a mortgage-free roof over her head (and a precious memory of her husband unwittingly giving her that from beyond the grave). That Wilf can be comfortable for the rest of his life. And that "my best friend" and the man she loves can do what they want. Personally, I find it a damn sight easier to swallow than the American convention where, hey, even if you never seem to work you can still afford to live in a fabulous house/apartment and never wear the same clothes twice. Intrigueingly, many non-Classic Who fans seem to have gone straight for the Doctor's Mother as the identity of the Time Lady, while fans might plump for Romana or Susan (I like to think it was Susan, not sure why). Ya, I was thinking -- and prefer -- the woman be Susan as well. It's a better fit for the character than his mother, which imho is a bit lazy. As in seasons past, this last 2-parter was overstuffed, relentlessly nonsensical, and close to unwatchable at times. I felt bad for Simm, Dalton, Cribbens, and pretty much everyone involved -- especially Tennant, a great Doctor who deserved a better hand at the helm. With that in mind, I'm definitely glad to see the show in Moffat's hands at last. His entries have been far and away the best that nuWho has provided so far. He gets the feel of the old show better, and his episodes have usually been constructed around interesting sci-fi/time travel ideas, rather than the derivative camp of Davies' episodes. Bring on the Moff. How about that the woman in white was the Doctor's wife from the Susan line of events? Could explain the glance back to Donna as she a bride. It may also have been his daughter (Susan's mum). I'm sure it opens the door for someone's future storyline. I just have to say that if it wasn't for RTD, I wouldn't be a Doctor Who fan and I wouldn't have rented every episode of classic Who episodes that Netflix has to offer. I'm thinking that the woman talking to Wilff might be The Doctors' grand daughter from the first William Hartnell season. I was also thinking that maybe it's Romana. She decided to stay in E-Space, but I know in other Doctor Who material, it says that she returned and ran for President. The Doctor had this sad, remorseful look when he looked at her and those are the only only two people I can think of that would make him feel that way. "What else can The Doctor do for Donna and her family that isn't going to kill her? He can't give Donna her memories back and take her away in the TARDIS, but he can make sure that Sylvia will always have a mortgage-free roof over her head (and a precious memory of her husband unwittingly giving her that from beyond the grave)." you left out one - he can save the life of her grandfather. Actually in the last scene between the doctor and Wilf I thought two things - wow Wilf has a hell of a saluting fetish, and The doctor is still pissed at Wilf. 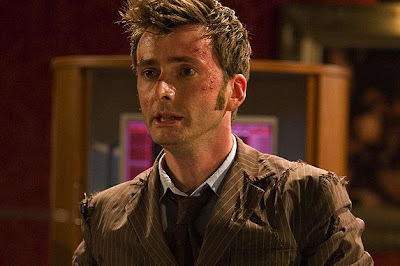 Stupid question, but couldn't the Doctor just cut off his hand again and use that to regenerate so he wouldn't change? Before watching TET, Part 2, I saw the Waters of Mars. When the Doctor was faced with Wilf in the chamber, I thought K-9 would have made an appearance much in the way the Doctor thought of using the robot that helped save the Doctor in Waters of Mars. If I remember correctly, the Doctor sent K-9 to his death in the episode when Sarah Jane returned; but, I think he rebuilt him. Well when that happened in the Christmas Invasion it was within the first 15 hours of his regeneration so there was alot of excess energy from the regeneration to do that. Also that is where the Meta Crisis Doctor came about as well. In others words no he could not. Thanks Tesswpfd17 for the explanation! Imagine K-9 emerging from the chamber wagging his tail and the Doctor saying "Good Boy!" Well there may not even be a definitive answer, sometimes writers leave these things open so that they or someone else can decide later on. For my part I like to think it's Susan, she does look a little like an older version of Susan and if a Time Lord doesn't die by accident it seems that they do age. The Doctor told Susan that he would come back for her one day and we have assume that he did; she couldn't have lived with David fro too long, he'd get old and she'd keep regenerating. Could be his mum, could be Donna, could be Rose it could even be the Doctor! But I like to think it was Susan and I'll stick with that until the series says otherwise.